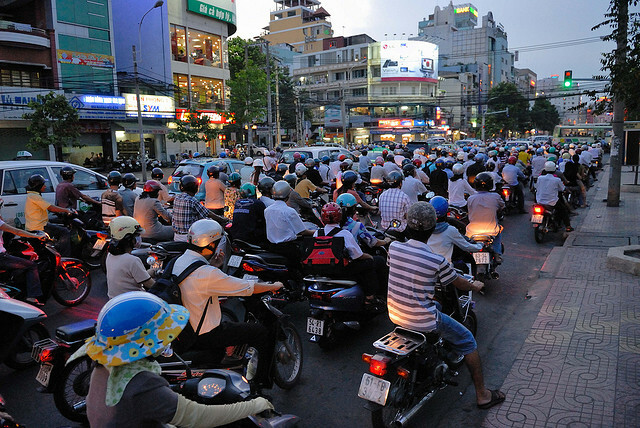 Motorbike traffic stacks Ho Chi Minh City. A new BRT line could alleviate congestion in Vietnam’s largest city. Photo by Padmanaba01. A struggle between residents of a high-income community along a valuable stretch of waterfront in Hobart, Australia and local officials may rekindle to nix a AUS$30-million (US$31-million) bicycle-pedestrian lane proposed by the state government of Tasmania. The lane would connect the city to the University of Tasmania and the three most urban areas in Tasmania. As nearly $2-trillion in Federal transportation allocations are expected to be spent in the coming decades in the greater New York City area, community meetings are taking place in the transit underserved Bronx borough of NYC. Expanding transport access to the region’s commuter rail was of chief concern to local elected officials, despite nearly 95-percent of the Federal funding being allocated for upkeep of current infrastructure alone. To submit a proposal for the remaining 5-percent of Federal funds, as part of contributing to the region’s 30-year long term plan, you can visit the MTA comments page here. Protesters in Lagos have attacked three BRT buses on a Ikorodu Road, a primary thoroughfare in Nigeria’s largest city, terrifying passengers in what was described a s a”minor smashing” of the buses. Those alleged to have attacked the buses used stones and bottles as projectiles and assaulted police forces in kind. The attacks come at a time when the State has raised fares on BRT by 200-percent, causing widespread rider outrage. Some of these protesters were “okada riders” or motorcyclists, who broadly demonstrated against their mobility restrictions throughout Lagos. In a victory for the Delhi Government, the High Court of Delhi has reversed its previous decision to open the dedicated right of way for BRT buses along the 5.8-kilometer (3.6-mile) corridor to other vehicles. The government has boldly embraced the legal grounds for BRT, planning 14 more corridors throughout Delhi. Initial protest, that the BRT added to congestion along the corridor, has been deemed unfounded as the BRT moves more people than the surrounding private vehicles throughout its hours of operation. The full court preceding can be found here. As Los Angeles County expands its rail transit capacity, adjacent Orange County transport officials are considering widening Interstate 405 to accommodate high occupancy toll (HOT) lanes throughout a congested strip of the corridor. Alternatives for the expansion range between $1.3 and $1.7 billion – roughly the GDP of Belize. Across town in Anaheim, the home of Disneyland, City planners are recommending the construction of a 3.2-mile, $319-million streetcar line that would connect a future high speed rail station, Disneyland’s campuses, and local retail businesses. The E.U. Climate Commissioner, Connie Hedegaard, has instated new rules limiting the use of first generation bio-fuel across the 27-member bloc. The new rules, which will take effect in 2017, address greenhouse gas and air quality concerns created by production of bio fuels, some of which, “are as bad as, or even worse than the fossil fuels that they replace,” according to Hedegaard. The E.U. will suspend subsidizing the growth of particularly egregious fuel sources when the rules take hold. The Federal Highways Administration, a node of the U.S. Department of Transportation, has produced a simplified policy guidance tool, allowing localities to more easily access exactly how they can use pedestrian and bicycle infrastructure funding. The new funding for so-called, “transportation alternatives,” allows local governments to have a much stronger role in dictating the creation of ped-bike facilities. San Francisco’s public transport authority, SFMTA, continues to suffer systemically poor on-time performance on its buses and trains. Only 56-percent of MUNI’s buses, trains, cable cars, and streetcars run on-time, a 5-percent dip over last year. As part of Measure E, a local law passed in 1999, the agency is mandated to run vehicles with an 85-percent on time performance rate. The French Prime Minister, Jean-Marc Ayrault, was in Cebu City, Philippines this past week, lauding the local leaders’ decision to create a BRT system. The $212 million Trans-Cebu is being funded in part with a $52-million loan from the French state development agency, Agence Francaise de Development (AFD). Across the South China Sea, municipal administrators in Ho Chi Minh City are planning to create a 25-kilometer (15.5 mile) BRT corridor connecting the East and West portions of the city. The bulk of these costs, $142 million, will be financed by the International Bank of Reconstruction and Development. The project plans for system are due out later this month.